Thanks for logging onto whogivesamonkeys.com I hope you’ll find it informative as well as entertaining. I’d love to hear your thoughts about any of the posts, so please feel free to write comments, warts and all. I’ve been a journalist for 20 years and covered everything from news and entertainment; to politics and sport. But the one area that’s always been of interest is natural history. Let’s face it, who wouldn’t want to have Sir David Attenborough’s job?! In 2010, I took the leap of faith and decided to go back to university to re-train to become a Primatologist (the study of monkeys and apes). Why? Many of these magnificent animals are threatened because of us. It saddens me to know that some species could become extinct in my life time due to man’s actions. My trip to Uganda in July 2010 was life changing – the people I met and the areas I visited definitely influenced my decision to retrain when I returned. I qualified with a Masters in Primate Biology, Behaviour and Conservation in 2012. Going back to study was tough, but also very rewarding and an incredible eye opener. It showed me how many issues are inextricably linked (in particular development and conservation). Help the local people and you’ll help to preserve the wildlife, they live side-by-side and can only flourish if they work in tandem. So many people in the UK have asked me: “Why should I care?” because everything you do has a direct impact on the planet – what we buy; what we grow; how we live, the list goes on. If we want to preserve our home for future generations then we need to start acting responsibly, not selfishly. In the past I’ve tried to use the news platform to raise awareness in this area. It’s not always easy. I would like to try to be the bridge between the world of journalism and the academic one. During the last decade reporting has helped me to broadcast important issues about our wild kin’s plight and the countries they live in. I am now working as a scuba instructor and every day on dive briefings I push for a better conservation attitude on land and underwater. The more I travel the more I have come to realise that all species need better protection from anthropogenic extinction. And perhaps we really should give a monkeys afterall. Wow! Wow!! Wow!!!. Now you’ve got me zapped and you’ve got me nailed to your blog. Once in a while I click in and out of blogs and I slowly tend to get bored. Most of the blogs are mundane…..Then came your blog – full of gray matter….I love animals too…..And here I am, a fan of yours who’ll follow your site to support you and the animals you support. Hello and many thanks for subscribing, glad you liked the blog, sorry I had to sub your comment, but it was far too long. Keep them coming, but just a few sentences next time. That pic of those monkey in a line is too good. Now that’s team work, following the leader. Obviously the guy with that green fruit in his mouth calls the shots. Why don’t you cover other interesting monkeys around the world. Interesting fellows these monkey. They spread joy and kids love them the most, after circus clowns. Right? The blog is a work in progress and I hope to cover many species of primate in time, there just has to be an approriate angle. Hopefully you’ll sign up and learn more about the varied and wonderful species that there are out there. Do you want to know the truth? Chimps and monkeys are BORING. They kind of look silly. Humans gave them more credit than they deserve. They are not interesting like other animals. They are not like dogs which give you unconditional love. They are not like cats that look so individual and cute that you love their care-a -F attitude. Monkeys- are pests. thay can swarm a place and cause havoc. I know that there was no other alternative but to trap them en masse and kill them. It happened and people were relieved. They were a menace. They look ugly and not beautiful like other animals. I was kind of wondering and trying to figure out why yu liked this menace animals. Richard Attenborough. Don’t know but Monkeys? Entertainment in a zoo of circus only. In the wild or as groups they are a sickening menace. Ok I take your point. Actually my comment is related to a village where I believe that a swarm of monkey were a terrible menace. They would carry away little puppies, rob food from homes, snarl and bite people who would confront them, carry things away, destroy plants, terrorize kids. That’s why chimps apart monkeys can be more dangerous than other animals. Finally what did the guys in village do? They laid traps and killed the monkeys. I agree that they could have been more humane and let them off far away. But you can imagine how frightened the people were, sometimes to even step out of their houses or get inside compounds. Even dogs, individually they are beautiful animals, in a pack the canine herd mentality of wolves surfaces and dogs in a pack can be really mean. By the way I am an animal lover. I don’t even harm insects if I can help. I was playing the advocate on the other side. Forgive me, actually when I was a kid I was a victim of a vicious monkey chase- you know those red monkey usually led by a larger one who commands the troops? Zoom, i ran into the house and locked the dorr. Then came out with a big stick and that kind of scared the monkey and it ran up the tree. I’ll never forget that. I couldn’t believe it when you wrote that you had been made redundant and freelance work had dried up for you too. You were one of the best news presenters for both style and clarity. You have a really good vibe about you. I think the sort of energy someone exudes is an important thing in life. Your smile brightened up my day even after a sobering news bulletin. What a smile. Okay, I won’t get too carried away here but suffice to say Channel 5 and Sky News etc. simply must not have cared about viewing figures if they didn’t want such a beautiful woman presenting for them. Still, it has allowed you to pursue your passion for Primatology and we are often most productive and contented when we can work at something we care deeply about. Academic study is such a worthwhile undertaking. It has been one of the most fulfilling things I’ve ever done despite it being a real struggle at times. Good luck- I’m sure you will succeed in blending your journalistic and academic abilities to further the awareness and protection of monkeys and apes. Many thanks for the support, life has a funny way of pushing us down different avenues. It’s been an incredible year and I don’t regret for a moment returning to study. Who knows where this will take me?! Your support is very much appreciated and I hope you’ll subscribe to the blog – feel free to post comments – I like to hear what my readers think about the pieces. I thought you had moved to the Beeb as a career move then wondered why we didn’t see you a lot. I’m sorry to hear that didn’t work out for you but I am sure you will return stronger, just look at what Brian Cox is doing! You can do it, best of luck. Prof Brian Cox is a source of inspiration, and I’d love to be able to work in this field and make it more accessible to the public. Thanks for comment. Yes chimps can be very aggressive and their strength is quite astounding. The ones in the wild are more wary of us (man) than those in captivity. I haven’t seen the gorillas in the wild yet, they are magnificent animals! It’s something I definitely hope to do before they die out altogether. I hope you’ll subscribe to the blog and I look forward to seeing more comments. Would just like to support the comments about your prior career. It is absurd that you were squeezed out when it would have been clear on any poll that your style and smile were ratings boosters. There is often little to choose between news programmes otherwise. You provided a reason to choose. Perhaps you will try again for your public’s sake? But good luck with the course and new venture. I have had two abrupt career changes myself, as the plaything of fate, and each has led to a substantial improvement in happiness and fulfilment. Perhaps it is a kind of speeded-up lifelong ‘evolution’ rather than a trajectory. many thanks for the support, it’s always nice to have encourgement. Who knows, maybe once I’m qualified I’ll be able to combine both skills and make more worthwhile programmes. Hope you’re enjoying the blog and do feel free to sign up. I’d like to add my voice to the sentiments that have been expressed above. I never watch Sky News or 5 News now, either. Your attractive appearance and pleasant personality made watching the news a joy ! That’s very sweet! Sky News is still worth watching though, the team out there – Stuart Ramsay in particular – has done some pretty impressive coverage of Egypt and Lybia recently. As others have already posted, I used to enjoy seeing you on screen although would find it a little confusing to find you on Sky Sports News one day and FiveLive the next. If they decided not to sign you up then it’s their loss – and ours! I admire you for the direction you’ve taken and hope you are rewarded in due course – hope to see you back on screen soon reporting on a subject you clearly love. Many thanks John for the message and for signing up! I see people like you trying to “fix” the wrongs and educate the world. It makes it all the worth while knowing there are people out there like yourself who appreciate how important it is to safeguard the planet and its species, no matter how big or small. Thank you for the encouragement. I sincerely hope I can make a worthwhile contribution to conservation once I’m qualified. When I have days like today, when I’m left frustrated; disappointed and chasing my tail to meet a deadline in my “day job” only to have my piece dropped…..it reaffirms for me, there’s definitely better ways to spend 12 hours working. Thanks for the message. Sky Sports News days feels like a lifetime ago now, it’s been more than two years since I worked there. Did your friends enjoy their time in Rwanda? It’s a country I would very much like to visit. Hope you all’s good with you. my friends were surprised by Rwanda especially given its political history – they have managed to overcome the tribal issues, infrastructure is brilliant. The treks to see the mountain gorillas was fantastic apparently – sounds great. Asha, I was glad to have met you and I hope that the decision was partially influenced by what we took you through. Thanks for all that you are doing. Am appreciative that I met you. We can for sure stay in touch and do more conservation and primatology work together. Long time no speak! Can you believe it’s been almost a year since I was in Uganda? My time on Ngamba Island and in the Budongo Forest Reserve definitely reinforced my decision to delve deeper into the study of primates. It was great to meet you and the team at the sanctuary, you’re all doing great work and I hope things are well with you and the rest of the team. I’m hoping to get over to Africa next year for my research, so maybe if there’s time I might come back to see you all. Well done! on your new career. With climate change, constant war and human hubris our primate cousins are having a hard time at the moment. We`last talked about a doc on Female Combat Reporters. While companies thought it was a good project everyone asked about conservation docs esp the change on our primate cousins. Good luck with all and hopefully we can work together at some time. Look forward to posts and adventures. yeah and don’t forget it! Thanks for the support Tim. I just stumbled upon your blog today and I look forward to reading more. Where did you study primate behaviour? 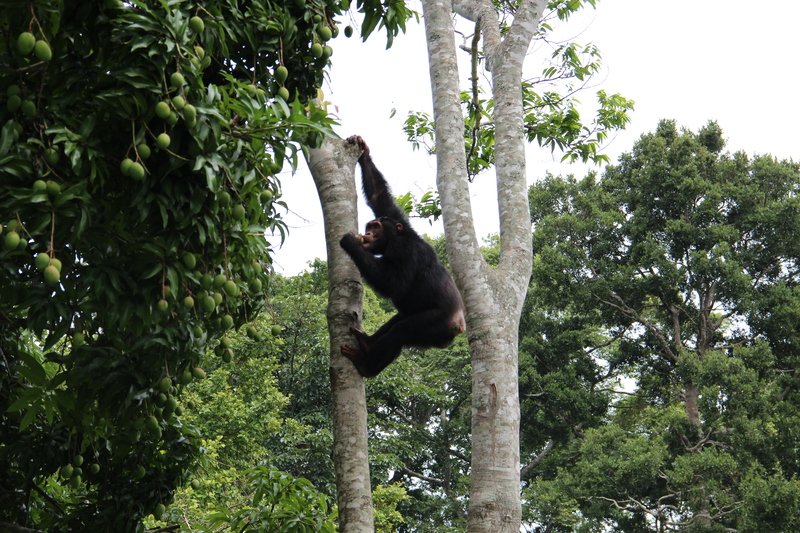 I start the MSc Primate Conservation course at Oxford Brookes in September. Very much looking forward to it. Congratulations on your placement. I hope it all goes well at Oxford Brookes. I did my modules (Sept 2010-July 2011) on primate behaviour at Roehampton University. As I don’t have science at A-level I had to do specific modules from the final year of the Biological Sciences degree to prove I could cope with that level of understanding. It’s been tough going back to study, especially to a discipline that’s quite alien to me. But the topic is fascinating and topical, especially for a journalist and I can’t wait to start my Mres in September. I hope you’ll subscribe to the blog and post more comments. Best of luck with your course. I’m an avid reader. Great stuff, keep it up. Just seen your blog, which i would like to congratulate you on. I am Landscape & Garden Designer and am trying to inform and design in areas for habitats within the garden and urban areas, to clients. A Very hard task. Good luck with your efforts. Thanks for your message. I appreciate the encouragement! doing to the forest and the gorilla? Thanks for your comment. Will have to find out more this first before I can comment. I’m on a mini break….so will get back to you soon! As I understand Tantalum is a material essential when it comes to manufacturing electrical components known as pinhead capacitors. It’s sourced from colombo-tantalite ore, or coltan which is mined. Yes you’re absolutely right about it being mined in areas that are leading to the destruction of habitats, so it will impact on the primates and other species in those areas. It’s also so lucrative there are concerns about security of local people mining who can be visited by bandits especially in DRC where there are large reserves. Another cause for concern is that villagers who have stopped farming in order to mine this material will no longer have a livelihood once these reserves run out. Giving an iPad to an ape is probably not the best way to interact with an animal like that. Their cognition, at best, will be like that of a 3-year-old human. Although they are highly intelligent animals, people will never humanise apes unless they scientifically alter their genetic make-up, and that would be a dangerous thing, not to mention ethically questionable too. So yes iPad is (a) wasting it’s time – perhaps it’s more about publicity – and (b) being terribly hypocritical if indeed tantalum is used to make its gadgets because it’s indirectly funding the destruction of these animals’ habitat! RE: Coltan mining – it is currently a subject of some debate. A recent BBC News article painted an innocent picture of the industry but in my opinion from research into the subject it is not only causing further exploitation of the Congo’s resources and people, but degrading the habitat of gorillas, with the potential to affect chimpanzee and bonobo populations if the industry continues to expand. Here are two conflicting opinions and links to other sources. Thank you for sending this through. Any area which is disturbed by man is bound to have a knock-on-effect on the wildlife both in that area and the surrounding areas. Unfortunately every trade that has the potential to earn vast quantities of money is always considered more important than the consequences to the natural world. Coming from a robust engineering background, I’ve found reading your blog posts refreshing and certainly a positive distraction. I look forward to future reads! Asha, just got to see the piece you filmed with me on Woodfuel in South Yorkshire, was really pleased with how it turned out. Hope it wasn’t to painful working with a novice! I had no idea that I was working with such a media star, apologies. Good luck with the studies and thanks for treating me kindly. I watched an inspiring documentary on the BBC HD channel this evening, “Natural World”. If you’ve access to the BBC iPlayer, then I’d thoroughly recommend this for viewing… http://www.bbc.co.uk/programmes/b00ykxq9. My name is Evan Williams, I am a reporter working for various TV programmes here in the UK. I would like to have a quick chat with you about West Africa if that’s ok. My email is below. I’m from Chicago, IL. I recently graduated from my undergrad that has nothing to do with primatology. Your story has made me want to transition into following my passion studying primates. You serve as a great role model for people who want to make a switch similar to yours. Taking any interns? haha. I’ll always be following your journey from the states. Thank you for being awesome. I wish you every success with your plans. I am a firm believer in following what your heart tells you. Thank you for the lovely comment, it’s very flattering to know I’ve been a source of inspiration. I remember you from the news..kinda a jealous that your doing something that you always wanted to do. Good for you. Will follow the blog keenly. I love this blog! i use to watch you all the time was wondering where you went 🙂 keep it up and btw u look stunning as ever! Hi Asha, I’ve just come across your website after trying to find some information about Gorillas in Uganda while watching C4 news and you suddenly popped up doing a PTC…how mad is that ? I’ll look forward to reading about your trip because I’m off to Uganda, hopefully in October. Like you, I’m a reporter, I work for ITV Central and I’ve just had the go-ahead from my news editor to cover the 40th anniversary of the expulsion of Ugandan Asians ( I was born there and have wanted to go back and see the place my parents used to ‘rave about’ for years). And it sounds like you’re also fascinated by gorillas. My dad thinks I’m mad and tells me the border areas where the gorillas can be found are sooo far and dangerous ! Hopefully, you’ll tell me otherwise. Anyway, good luck with the primatology, sounds very interesting and keep up with the blogs. Thanks for the email. You can read a wide variety of material giving you more in depth detail about the range of the mountain gorillas from trustworthy conservation sites like Diane Fossey Foundation and WWF. Their habitat straddles three countries (DRC, Rwanda and Uganda). If you are a reporter then you’ll be able to judge just how safe it is for you to travel to any of those areas. Hi Asha. I am a portrait artist and was looking online for a chimp to draw when I came upon your ‘winking’ photo of Zig. Just wonderful. Do you mind if I draw this image? Many thanks for contacting me about Zig’s portrait photograph. That’s absolutely fine. I’d be interested to see how you get on, so if you you upload it onto a website do send me a link. Thanks so much for the comment. I am so sorry it’s taken an age to get back to you. Lovely pictures. If you have any projects in particular that you are doing at the moment. Happy to blog about it and host your images. Hi Asha, great blog and we’ll done for actually doing something to help highlight the issues surrounding the plight of the great apes. I have just watched the Channel 4 news article about animal trafficking in the Amazon. It depresses me so much it hurts, the exploitation of nature that goes on in the world sickens me to the core, I have this real sense though that it’s too big a problem to solve. Part of me wants to bury my head in the sand and pretend these issue don’t exist, as long as you don’t watch tv, read the papers or look online the problem goes away, but that’s not the answer…what do individuals like me do? Cheers Mike. Thanks Mike, love your honesty. Raise awareness with people who don’t know about these issues. Give (financial support), if you can, to conservation groups and try to buy products that are “ethical” and “sustainable”. Having a conscious is half the battle. Very much enjoying reading your blogs and of your interest in natural history. I’m a producer director working for Discovery, currently making a series about an Orangutan rehab centre in Borneo and developing another show about a wildlife rescue unit in the country. Would it be possible to tell you more about this. There is more info about my work at http://www.philstebbing.com and can be contacted at philipstebbing@gmail.com if you feel this would be of interest. I’m brand new to both primatology and journalism but it’s pretty cool to meet another person with that combo. So many people tell me that they would never see both journalism and primatology fitting together, but hey, I think they work just fine! Nice website, I loved your Uganda post. Helloo Asha hope you are fine and doing well. I live in Turkey, i was watching TRT world when you were raporting Ankara explosion last day and searched you in facebook. I think you dont have any facebook ID am right ? Now a days i am doing my master degree at Gazi university in relastionship. I am also a journalist at Ayna TV And Aryana international TV from Afganistan. I really enjoy reading your stories and looking forward to read new ones. Maybe you should proof read your work. There are quite a few errors here for a seasoned journalist. If I had more time in the day, yes. When you travel solo, remotely and have limited wifi it’s an aspirational goal.